Hayley joined Chambers as a tenant in October 2017 following successful completion of her pupillage under the supervision of John Ward-Prowse and Russell Pyne. Hayley is noted for her thorough preparation and creative approach to legal problems and has been complimented for her personable style with both professional and lay clients alike, giving practical and robust advice in a calm and comprehensible way. Hayley accepts instructions across all of Chamber’s practice areas, with a particular emphasis on family matters including public law proceedings, injunctive cases and matrimonial finance. During pupillage, Hayley gained experience in family, civil, crime and immigration hearings, receiving instructions in all areas during her second six. Before joining Chambers, Hayley worked as a paralegal for a family law firm where she gained experience in family matters involving divorce and financial remedy proceedings, private law children proceedings and injunctive cases. Hayley is authorised to accept instructions on a direct access basis. 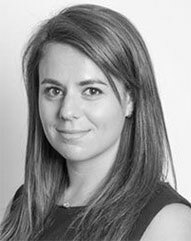 Hayley is instructed on a full range of children matters in both public and private law proceedings. In public law, Hayley has represented local authorities and parents and has experience of matters featuring issues of emotional abuse, domestic violence, neglect and drug and alcohol dependencies. Hayley recently worked within the legal department of a Local Authority on the South Coast on a 3 month secondment, where she represented the Authority on a number of cases and gained vast experience in public law matters including cases featuring sexual abuse, special guardianship applications and emergency protection orders. In private law, Hayley is regularly instructed to act for parents in Child Arrangement Order applications, leave to remove applications and applications for parental responsibility. Her exceptional client skills mean that she is accomplished at gaining the trust of clients and working with them to achieve the best possible outcome. Hayley regularly acts for both applicants and respondents in matrimonial finance cases up to and including final hearings. Re H (2018) – represented the Mother following the Local Authority’s application for an interim care order where the care plan was to remove the child into foster care. Successfully negotiated for the Mother to be placed with the child in a residential foster home. Re T (2017) – represented a Local Authority in a chronic neglect case in respect of an application for a Care Order. Re B (2017) – represented a Local Authority following an application by extended family members for a Special Guardianship Order. Re P (2017) – represented the Respondent to an application for a Non-molestation Order and Occupation Order. Successfully negotiated cross-undertakings. Hayley is regularly instructed on cases involving road traffic accidents and credit hire claims, personal injury matters including infant settlement agreements, and contractual disputes. P v S (2017) – represented a defendant to a small claim following a RTA where the claimant relied solely on the evidence of a young child. Claim dismissed. I v M (2017) – represented a college in a claim for non-payment of tuition fees. Claim awarded in full. S v P (2017) – represented a defendant to an application for a stay of execution of a judgment debt where the claimant had been previously found to be fundamentally dishonest. Application dismissed.